Mary Ellen Taylor, 91, of Coatesville died on Tuesday, November 20, 2018 at The Phoenix Care Center, Phoenixville. Mary was the widow of Nelson S. Taylor who died in 1965. Born in Philadelphia, Mary was the daughter of the late Louis and Anna Loborn Cornish. 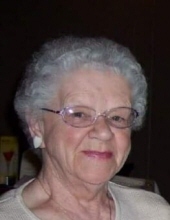 She was a member of Our Lady of the Rosary in Coatesville. She was employed as a seamstress. Mary is survived by 2 daughters; Kathleen L. Mellor of Royersford and Patricia (Brian) Deveney of Berlin, MD and a son, Robert L of Cape Coral, FL. She is also survived by 9 grandchildren; Sheila Cosgrove, Ron Taylor, Jr., Brian Deveney, II, Robert Taylor, Tricia Taylor, Megan Dempsey, Blair Taylor, Rick Taylor and Coleen Mascherino. She is further survived by 9 great grandchildren; Ian, Ariel, Coral, Jordan, Cody, Zacrey, Taylor, Jameson and Anthony and 1 great great grandchild, Jillian. In addition to her husband, Mary is predeceased by 3 sons, Ronald J, Richard C. and Nelson S. Jr., and 4 brothers and 3 sisters. Mary’s Funeral Mass will be held on Wednesday, November 28, 2018 at 10:30 am at Our Lady of the Rosary where family and friends may call from 8:30 to 10:15 am. Interment will be in Riverside Cemetery, Norristown. Memorials in Mary’s honor may be made to Our Lady of The Rosary, 80 South 17th Avenue, Coatesville, PA 19320 or the Alzheimer’s Association, 399 Market St #102, Philadelphia, PA 19106. To send flowers or a remembrance gift to the family of Mary Ellen Taylor, please visit our Tribute Store. "Email Address" would like to share the life celebration of Mary Ellen Taylor. Click on the "link" to go to share a favorite memory or leave a condolence message for the family.